Some persistent misinformation involving “Black Dog” has been floating around for quite some time now. 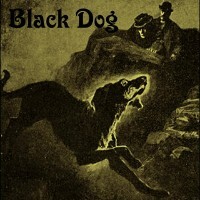 The first point is that “Black Dog,” which opens Led Zeppelin’s untitled 1971 album (also referred to as Led Zeppelin IV or Zoso), borrowed too heavily from Fleetwood Mac’s “Oh Well.” In Led Zeppelin: The Complete Guide To Their Music, Dave Lewis states that Jimmy Page “would admit years later” that the vocal part for “Black Dog” was taken from “Oh Well.” It’s ironic when an apologist for the band implies wrongdoing where none exists. Not only is this point groundless, I would argue that “Black Dog” is one of Led Zeppelin’s most original songs. It’s off in its own world with its winding riff and complex time signature changes. Of course, it’s possible to cite songs that influenced John Paul Jones, Jimmy Page and Robert Plant to write this song, but to suggest “Black Dog” was plagiarized is off the mark. In their early days Led Zeppelin paid close attention to Fleetwood Mac, which was then a blues band under the leadership of Peter Green. Had it not been for Fleetwood Mac, Led Zeppelin might not have come up with “The Lemon Song,” “Rock and Roll,” or the vocal part for “Black Dog,” as Robert Godwin suggests in his book The Making of Led Zeppelin’s IV. Fleetwood Mac’s influence can certainly be heard in these songs, and “Oh Well Part I” and “Black Dog” have a similar call-and-response dynamic between Robert Plant and Jimmy Page’s guitar, but that’s a not the same as thing as plagiarism. Fleetwood Mac released “Oh Well” as a single in 1969 and most radio stations only played the side with “Part I”, which is the part that had the most influence on “Black Dog”. It’s interesting to note that Peter Green regarded “Oh Well Part II”, an expressive instrumental, as the greater achievement. 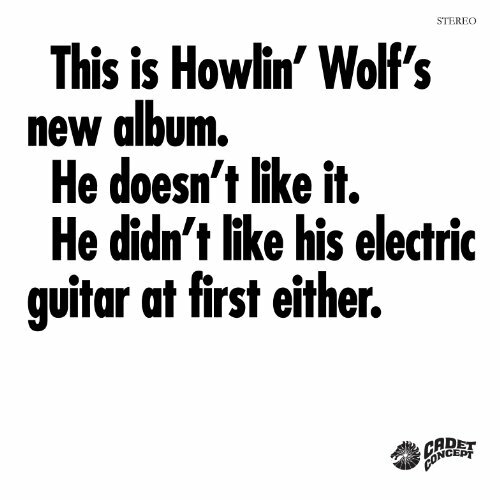 It’s not all that surprising that John Paul Jones mixed up Electric Mud and This Is Howlin’ Wolf’s New Album. Both albums were late-1960s attempts to “update” the sound of these blues artists by incorporating more psychedelic instrumentation. While both albums have interesting tracks to recommend them, you can tell that neither artist’s heart was completely into this new sound. 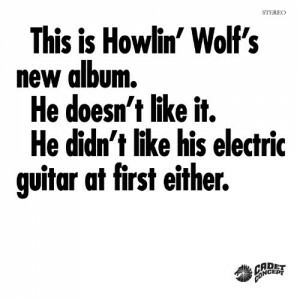 In fact, Howlin’ Wolf’s album explicitly stated the artist’s disdain for the record on the cover. This Is Howlin’ Wolf’s New Album also contains spoken interludes where Howlin’ Wolf explains why he doesn’t like his new album. One of his complaints was that electric guitars make “queer sounds.” But John Paul Jones listened closely to “Smokestack Lightning” and was inspired by what he heard. In the December, 2007, issue of Mojo, John Paul Jones told Mat Snow that the track had “a blues lick that went round and round and didn’t end when you thought it was going to.” Using that approach he developed the riff for “Black Dog,” stretching out the pattern over several measures and incorporating time signature changes, which has made this one of the most difficult songs to cover by the Hampton String Quartet, a chamber group that covers rock songs, as reported by Andy Fyfe in When the Levee Breaks: The Making of Led Zeppelin IV. While Robert Plant has resorted to plagiarism on other songs, that is not the case with “Black Dog”. Robert Plant again draws on blues imagery for this track, but with a more subtle approach than on “Custard Pie” or “Hats Off to (Roy) Harper“. On “Black Dog” he incorporates several basic blues images without drawing too heavily on a single source. The image of the “honey dripper” has been used by such artists as Joe Liggins, Big Joe Turner, and Roosevelt Sykes. Sykes even took to referring to himself as “the Honey Dripper” and, of course, Robert Plant used the name The Honeydrippers for the band he formed just after the demise of Led Zeppelin. “Down and out” is a phrase that many blues artists have used, including Bessie Smith’s “Nobody Knows When You’re Down and Out” and Sonny Boy Williamson’s singles compilation LP Down And Out Blues , released on the Checker label in 1959. Also, Freddie King, Brownie McGhee, and rockabilly singer Jerry Lee Lewis sang of a “big legged woman,” an attractive woman whose sexuality was dangerous. And then there’s the title of the song, a blues image in itself, though as Chris Welch explains, the song “was named after a friendly mutt seen lurching about the building during the sessions.” (I’m not sure “lurching” was really the word he was looking for here, but whatever). According to Debra DeSalvo in The Language of the Blues: From Alcorub to Zuzu , a “black dog” as it was used in blues songs foretold death, as in Blind Blake’s “Black Dog Blues,” or a partner’s infidelity, as in Lighnin’ Hopkins’s “Hear My Black Dog Bark”. All this is not to say that that Robert Plant plagiarized any one source. I put together a Mixcloud compilation of tracks that may have had some influence on Led Zeppelin when they wrote “Black Dog”. Listening to it should make it clear that while it may be possible to cite sources of inspiration for “Black Dog,” this track is Led Zeppelin’s original work. The use of blues images in “Black Dog” is an effective homage to the rich tradition of the blues while reworking the influences in an original way. Posted on August 4, 2013 October 10, 2013 by Dead Man	in Led Zeppelin: Plagiarism?. Tags: Fleetwood Mac, Howlin' Wolf, Led Zeppelin, Plagiarism.